TERRATEC has celebrated the delivery of the first two of its seven new TBMs destined for the Mumbai Metro’s Line 3 project, in India, following successful factory acceptance tests earlier this month. 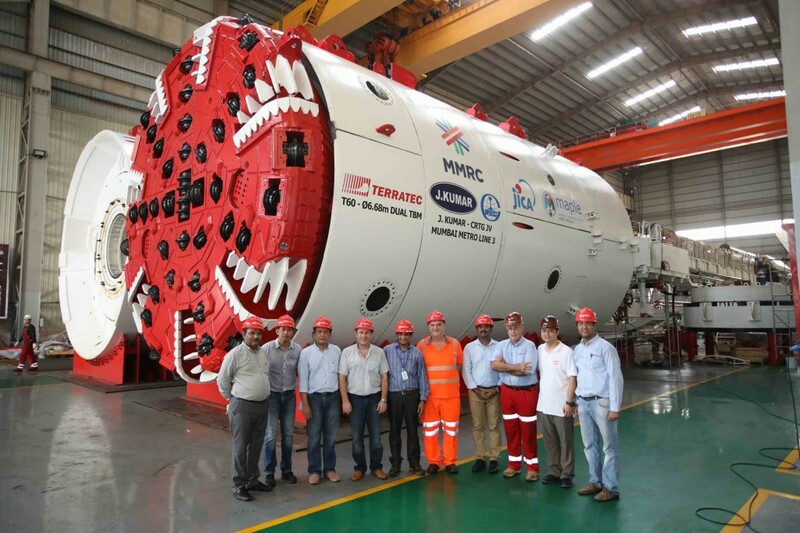 The first of these was a 6.68m diameter dual-mode hard rock TBM (T58) that will be one of two new machines deployed by the Hindustan Construction Company – Moscow Metrostroy JV to build the twin tunnels on the line’s 4.049km UGC-02 contract (Chhatrapati Shivaji Terminal Station – Mumbai Central Station), which was awarded by the Mumbai Metro Rail Corporation Ltd (MMRCL) in July 2016. The second machine delivered this month (T60) was the first of three new TERRATEC 6.68m diameter dual-mode hard rock TBMs ordered by the J. Kumar – China Railway No. 3 Engineering Group JV for the excavation of sections on the line’s 4.94km contract UGC-05 (Dharavi Station – CSIA T1 TBM receiving shaft) and 4.45km contract UGC-06 (CSIA T1 Station – Marol Naka TBM receiving shaft), which were also awarded last July. These versatile TERRATEC single shield TBMs are equipped to operate in either Open or Closed mode in the predominantly fresh and slightly to moderately weathered Basalt and Breccia that are anticipated on these contracts. The robust hard rock cutterheads are mounted with heavy duty 17” disc cutters, which are interchangeable with ripper tools, and feature large bucket openings that provide a 10% opening ratio. Other state-of-the-art features include 2,000kW Electric Variable Frequency Drives – that allow the cutterheads to cut efficiently in harder rock zones at maximum speeds of 7rpm and deliver an exceptional torque of 8,000kNm to cope with more fractured zones of ground along the alignment – as well as active shield articulation and built-in two component backfilling grout systems. In addition to the new TBMs, last month TERRATEC also completed the successful factory acceptance testing of two re-manufactured 6.61m diameter mixed/rock Earth Pressure Balance machines (S63 and S64), which will also be deployed by the J. Kumar – China Railway No. 3 Engineering Group JV in Mumbai. These TBMs were recently used on Delhi Metro’s new Pink Line and have since undergone extensive refurbishment in order to fulfil a section of highly weathered ground on contract UGC-05.